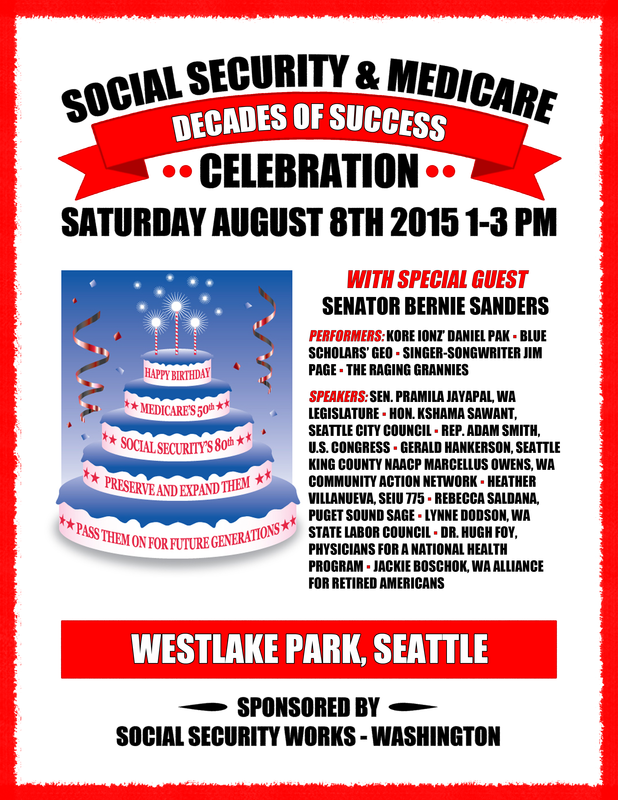 Join Social Security Works – Washington and hundreds of your Seattle friends and neighbors as we celebrate the 80th anniversary of Social Security’s, and the 50th anniversary of Medicare! We are rallying at Westlake Park on August 8th at 1 p.m.
Marcelas Owens – Youth leader, Washington CAN! Social Security and Medicare are crucial tenets of retirement security. They are the most successful anti-poverty programs in the history of the US, but face unrelenting corporate attack. Join us as we celebrate Social Security and Medicare while calling on our elected officials to protect and expand these program by scrapping the cap on taxable income, adopting the caregiver credit, and using the CPI-E to calculate benefits. Hello. Is Bernie Sanders still going to speak at this event? Earlier newspaper reports said he was.